Tech N9ne is once again showing love for his hometown. He sat down with Sarah Ashlock, arts and entertainment editor of UMKC’s U-News, for an interview on his beginnings as a rapper, and how he achieved success through Strange Music in Kansas City. Tech told U-News that at the beginning of his career as a rapper, he won a contest that earned him the privilege to be an opener for DJ Quik at Kemper Arena in Kansas City. There was just one problem: the concert fell on the same day he was supposed to walk in his high school graduation. He chose the stage. “That’s when I knew what I was going to do for the rest of my life,” Tech said about his choice to skip out on his high school graduation ceremony. Tech showed much respect for his mom and the town where he was born and raised. Tech said he doesn’t see why people have hate for Kansas City. “All my love is here,” Tech said about Kansas City. “This is my comfort zone.” He credited his family and status as The Kansas City King for the reasons why he loves his hometown so much. Tech talked about the benefits of Strange Music as an independent label. There are no restraints or censorship. “We’re trying to be another Def Jam,” Tech said. “Death Row, maybe. Maybe not.” Tech even gave a shout out to Suge Knight. “Humungous is what we’re trying to be, and we’re going in that direction,” Tech said about Strange Music’s success. 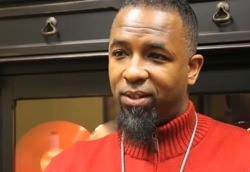 Check out the U-News video interview with Tech at Strange Music in Lee’s Summit below. Listen for what Tech had to say about Caribou Lou. Click here to read the print version of the story.